Academically qualified very pretty,​ fair,​ slim,​ charming and kind daughter sought by parents of a very handsome son,​ 5’10”,​ 165 lb. He will be 22 in January and graduating in June as an Engineer in a very specialized field from one of the top U.S. Universities. He already has many job offers in hand before Graduation. He hails from a very respectable Govi Catholic family who are well established in the U.S.A. He was born and raised in California,​ U.S.A. with good family values and he is caring,​ respectful,​ well mannered,​ and respectable. He is looking for a girl with a similar background from a reputed,​ respectable family. We are visiting for a holiday and can be reached by email at b​e​n​t​l​e​y​1​9​6​7​@​y​a​h​o​o​.​c​o​m​ and by Phone at 0912277499. Academically /​ professionally qualified kind hearted daughter (Preferred who is already in Australia) sought by Govt. Executive parents for their Engineer son 34,​ 5’8” living in Australia,​ PR holder. Divorced after a brief marriage,​ limited only to signature being the plaintiff. No encumbrances. Contact with horoscope details. p​r​o​p​o​s​a​l​a​u​s​p​w​@​g​m​a​i​l​.​c​o​m​ 037-5751650. 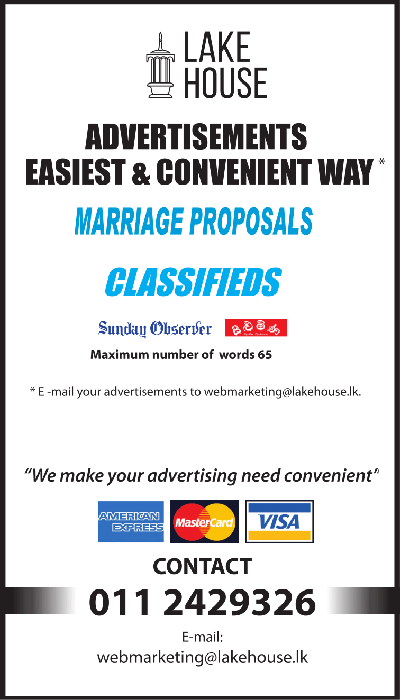 Christian,​ Sinhala parents seek a daughter for their son 29 yrs,​ teetotaller,​ non-smoker,​ 5’6” inherits a house in Gampaha District,​ IT graduate reading for MBA to be completed in 2019. Contact Tel. No. 0112234666 - email: c​n​4​5​6​0​4​9​@​g​m​a​i​l​.​c​o​m​ Gampaha and Colobmo Districts preferred. GB professional parents residing in Canada seek pretty daughter academically & professionally qualified in Engineering /​ Business for their handsome,​ Australian citizen son born 84/​6,​ 5’3” height,​ having assets in Australia,​ graduated from Australian University and employed as a Software Engineer in Melbourne. Caste and horoscope immaterial. Reply with family details and contact numbers. Email : p​r​o​p​o​s​a​l​2​0​0​0​@​y​a​h​o​o​.​c​o​m​ or post. Respectable educated religious wealthy Sinhala B/​G family from Colombo wishes to find a lovely educated daughter from a respectable family from Colombo or suburbs for our youngest son 5’10” tall handsome well mannered 29+ educated with bachelors and Masters Degrees form highly reputed overseas universities. He does not consume liquor or smoke,​ Director of a family owned group of companies and inherit substantial wealth including a super luxury house and a SUV. All our other assets and shares will be given equally to our two sons elder son is married to a Doctor. Please email or write to the mail box with relevant true details. A copy of the horoscope which is a must we guarantee the confidentiality of all your correspondents. Emali: m​a​n​g​a​l​a​k​i​n​k​i​n​i​1​9​8​9​@​g​m​a​i​l​.​c​o​m​ O125474,​ C/​o Sunday Observer,​ Lake House,​ Colombo 10. Sinhala Buddhist parents seek a pretty educated girl under 35 years for their youngest son MSc finance qualified business analyst vice president level living and working in UK British citizen. Reply with copy of horoscope to u​k​p​r​o​p​o​s​a​l​1​2​3​4​@​g​m​a​i​l​.​c​o​m​. Please only reply by email.